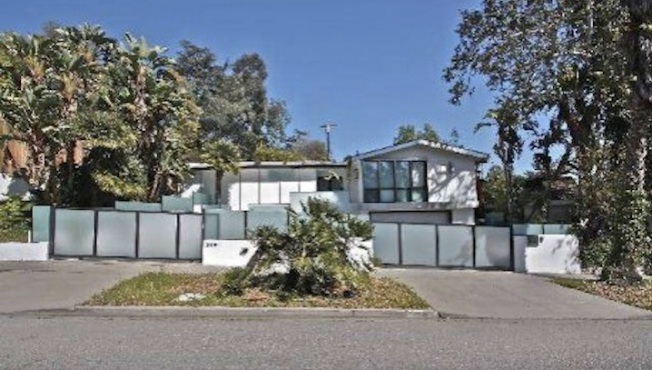 Jamie Kennedy is attempting to unload his "funky ranch" found on the edge of Griffith Park in the Los Feliz neighborhood of LA, for the third time, reports Realtor.com. Outside, the 2,400-square-foot home boasts frosted-glass panels while inside, you'll find a colorful aesthetic, said to be inspired by the W and Standard Hotels. Totally private behind gates, the home boasts two walk-in closets, dual fireplaces, and a spa-like bathroom. Telescoping doors throughout blend indoor and outdoor space. There are three bedrooms and four bathrooms. Outside, there are fire pits, an above-ground Koi pond, a built-in bar and dining patio area, hot tub, pool and cabana, plus beautiful waterflow. Kennedy purchased the home in 2007 for $2.15 million, then tried to sell it for $1.9 million in early 2012. He then relished it for a small discount, and now has returned it to the market for $1.889 million. Read the full story on Realtor.com.